You'll get to know your PLN peeps and make connections that will last far beyond this summer...and they'll get to know YOU, too! You might learn thing or two along the way that can impact your pedagogy. Sheri Edwards, Denice Krebs, and Paula Naugle have been involved in #JJAProject for the last few years. (Thanks for your tweets about #JJAProject tweets on May 31, ladies!) Here is Denice Krebs' blogpost about #JJAProject. 1. Take lots of pictures! I typically use my Phone camera. No fancy cameras needed. From the everyday, mundane to the dramatic -- anything in your world view is game. 2. Edit if you wish. Crop, add effects, have fun. No stress. Some of my fave editing apps are Snapseed, Enlight, Instaquote, WordFoto, ToonCamera. 3. Share a photo daily with the #JJAProject hashtag to any social media channel--Twitter, Instagram, Flickr, Facebook--or to all of them. Whatever floats your boat. You'll discover many amazing educators when you click the hashtag. I'd love to get to know you through your photos. TIP: ADD the hashtags of your favorite chats, state chats to your pictures on Twitter! The more the merrier. 4. Enjoy and comment on others' photos; interact and make new friends! Visual Thinking Strategies on TV! 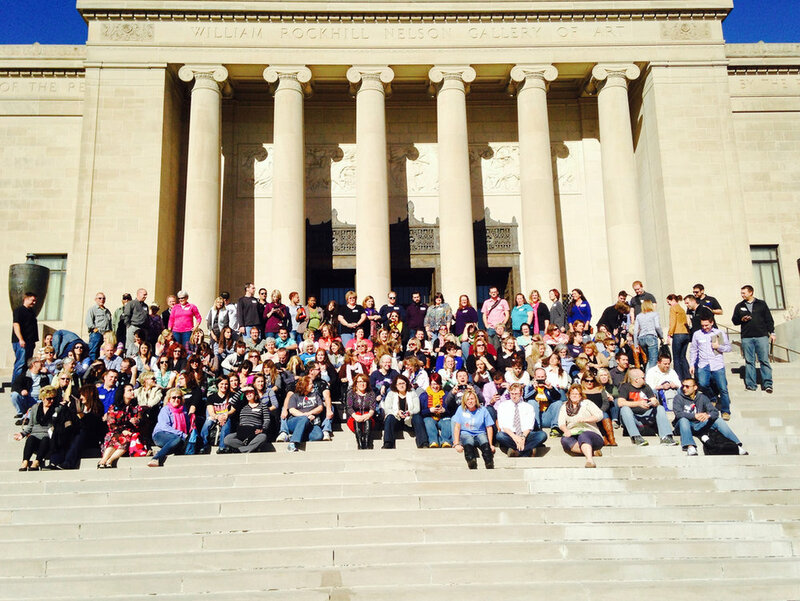 #edcampKC was November 9th at the Nelson Atkins Museum of Art. One of our big themes for #edcampKC was visual learning. Teachers and kids in schools live in a world of largely written text. We should use art and visuals (create and view them) in learning more than we do, but how? We need some help there. Common Core Standards address this as well. Lucky for us there's a method that the Nelson recommends and teaches teachers to use. It is called VTS or Visual Thinking Strategies. A plethora of resources on VTS can be found at www.vtshome.org. The Nelson is well on its way to becoming the VTS hub/training center for the midwest. Watch for training on VTS and educator courses. I'm signed up for all educator art courses in the winter/spring. During #edcampKC, Sarah Sims and Rosie Riordan led an activity/discussion/questions on VTS. Can all teachers feasibly work VTS into their units (all subjects)?! FYI: VTS is a group discussion experience. It is not designed to be individual, although it should start with time to look quietly before sharing and listening. I took part in a VTS activity with art in the Nelson in October. I learned so much and SAW new things and NOTICED new things as a result of sharing by members of the group. THIS IS IT. 3 QUESTIONS = VTS. None of this--> 'That's the right answer, Johnny." Just acknowledge their statements and seek the next hand up. Let each learner share and add to the group's growing knowledge. It's a cool experience. Now for the VERIZON COMMERCIAL! Here's an example of people being asked to approach art in an open-ended way similar to VTS. Just saw it on TV after #edcampKC actually, and I thought VTS immediately. It's a nice place for someone unfamiliar with VTS to jump in and see that it is accessible and doable. Watch this short commercial. What parts the 3 steps above are used? Which are not? The 'teacher' says the following 2 starter phrases akin to the 1st one in VTS series! "How do you react when you see this?" "What do you see here"
Good luck getting started. 15 minute activity. 3 questions. Group activity/discussion. You can do it. Now just try it! More ideas and info on VTS in the future! Check out this website, which was the basis for my educator art class story below. Direct quote from VTS website: "Using Art to Deepen Learning Across School Disciplines"
Suggestions straight from the Nelson educators about how to implement VTS with your students is pictured below. 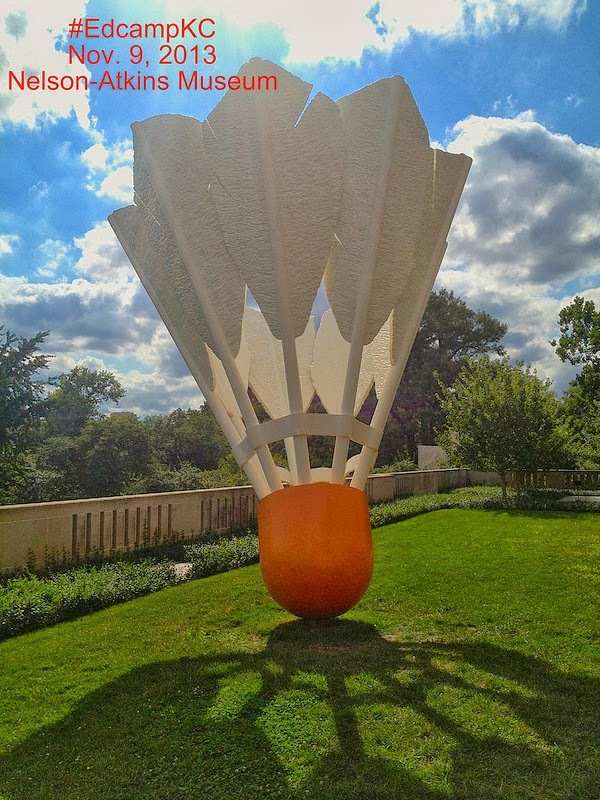 So there I was signed up to take -------> ...at the Nelson-Atkins Museum of Art in Kansas City. Date: October 17, 2013. Time: 6:30-8:00pm. Wasn't sure what to expect. I was excited about it, though. A nice byproduct of having #edcampKC at the Nelson is that I've needed to explore it so I'm familiar and can set up experiences educators can learn and grow from on Nov 9th and beyond. I belong to the museum now and am spending more and more time there by choice and desire. The clipboards! At 6:30 pm, the Nelson-Atkins instructors welcomed us talked to the 25 educators in attendance about VTS strategies as a way to get kids immersed in art and developing their inquiry and verbal skills. 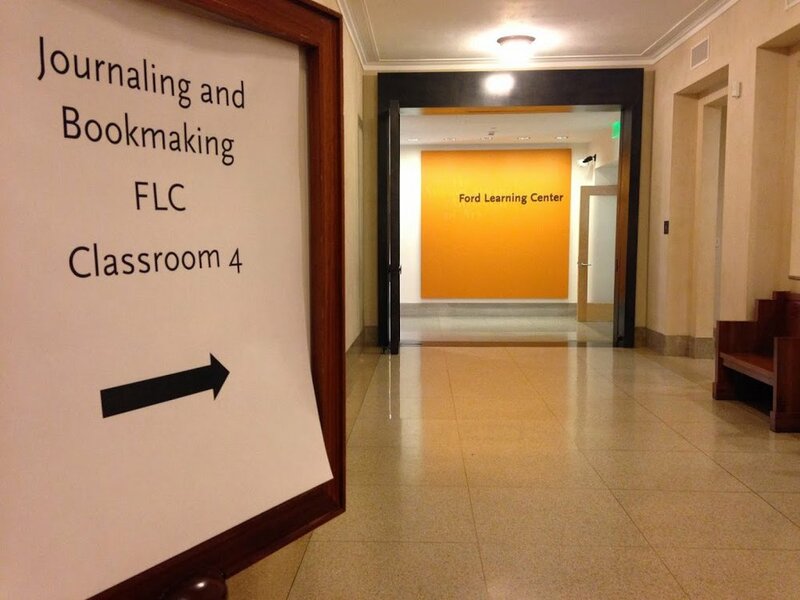 Here we go from our classroom in the Ford Learning Center (right in the middle of where we'll be for #edcampKC) down the hall and up the stairs to the heart of the art! We arrive in the room with our focus piece of art, a piece by Max Breckmann called "Baccarat." It's to the left of the center of this picture. This is what Adrienne and the Nelson-Atkins instructors let us experience. Adrienne led us through this masterfully and then asked us for our feedback; about how the process felt to us. "What do you think is going on in this picture? What do you notice?" When I originally looked at the piece of art I found myself doubting. Inner dialogue went something like this....."I don't know art terms. I'm not an artist." (Got a B- on a self-portrait I did in 3rd grade. I was really proud of that thing. I still remember that feeling. It hurt.) Anyway, I also found myself thinking for a moment, "What is she looking for in this question?" No, no, no. That's what school is too often about and we get used to it; living apart from our own thinking. Learning becomes about what OTHERS want us to think, find, learn. So the first hand goes up in our VTS exercise around "Baccarat." This person says something I hadn't thought of, and once she said it my brain had something to feed off of. The next person went and that person's comment fed off the first comment. The world was expanding for all of us, with each shared view. It went on and on. I'd say about 8 people added to our collaborative view of this artwork. I am much richer for interacting with that piece of art--IN A GROUP of curious learners. Now, every time I go to the Nelson and go in that room, I will have a great memory AND I feel like I have a sort of kinship with that piece of art. VERY STRANGE and COOL at the same time. Powerful. We felt safe in responding and sharing our observations, thoughts. 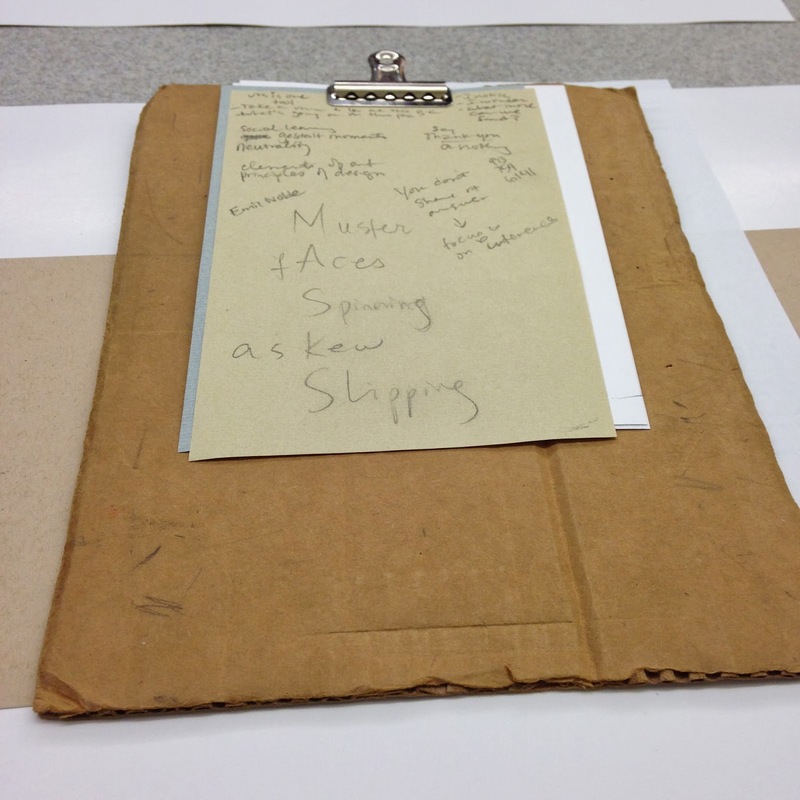 It opened us up to looking at art (an other things) in a new way. We also heard new words, terms, and were curious about Baccarat and what the picture really WAS about. All with a few quiet minutes of observation and group inquiry/sharing. Okay, so onto the SCIENCE and ART idea I heard Adrienne talking about. Adrienne said a Science educator she knows uses Pieces of ART and then pictures to kick off her units. They spend time using VTS methods for open inquiry with the art and pictures to create common building blocks in the kids' minds that all future learning in the unit (and beyond) will stack upon. My next Nelson-Atkins educator class is in November, the week after #edcampKC. The classes beginning in January merge STEM with Art...for STEAM. Educators, sign up here. One view in the Nelson-Atkins. Halls of wonder. sent to my Flickr email address to build a group photo-story. 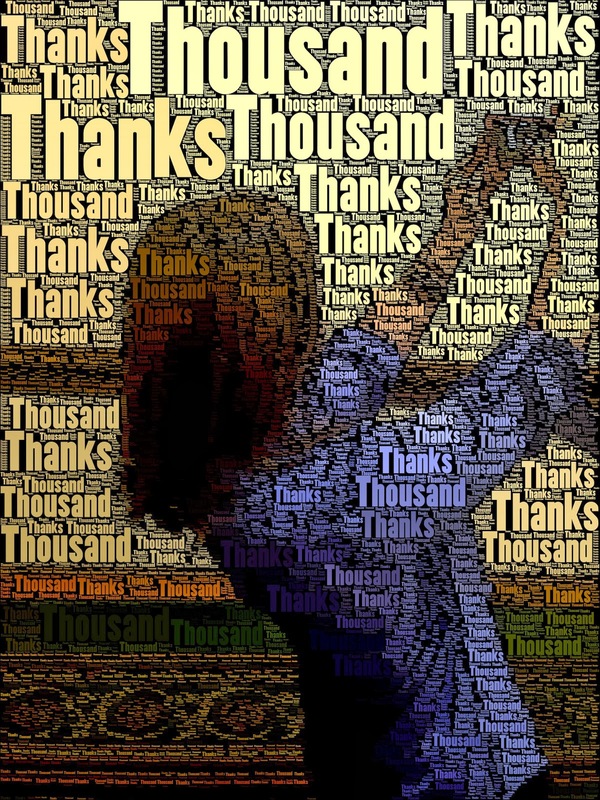 This is one of the photos created by educators in my Picture Perfect session at the MOREnet conference on October 14, 2013. Mike took this picture of me during our time together, edited it with the WordFoto app (which several of us then downloaded 'cause we liked it), and EMAILED it to my Flickr email address. MOREnet Conference Flickr Set! #2013M3 The conference as seen through many eyes--not just mine. I talked a lot about the opportunities Flickr affords educators during my session. How to find your Flickr email: Hover over your picture in upper right, click on Settings, and click on Emails and Notifications. Cool thing: You can CHANGE your Flickr email. If you give a group your email or tweet out the email, no worries about people having YOUR Flickr email address and photo-bombing you so to speak. :) You can change it whenever you want. Growing this idea at #EdcampKC in the perfect place and event for visual group storytelling. Taking this same idea on a bigger scale to The Nelson-Atkins Museum of Art for #edcampKC on Nov 9th. We will build a group-created Flickr set from all of us. We'll be able to see our day at the Nelson-Atkins through 300 eyes (ok, 600) --instead of just 2. Through 300 minds, visions, hearts. This year--everyone that wants to can build our Flickr set into something big, bold, and beautiful that can be used with kids, the museum, with educators. They can edit the pictures that day in the many beautiful spaces in the museum, in the auditorium during photo sessions and at home during the next few days.